A year ago I learned that my Los Angeles colleague, the photographer Charles Christopher, was making a wintertime pilgrimage to Venice, Italy, to fulfill a longtime dream of living in a stone house that he’d first seen and been captivated by as a fourteen-year-old boy. Charles’s subsequent journey of the soul resulted in an essay and a large portfolio of photographs, some of which were featured on HOLY WATERS (HW Guest Artist 3/11/11). 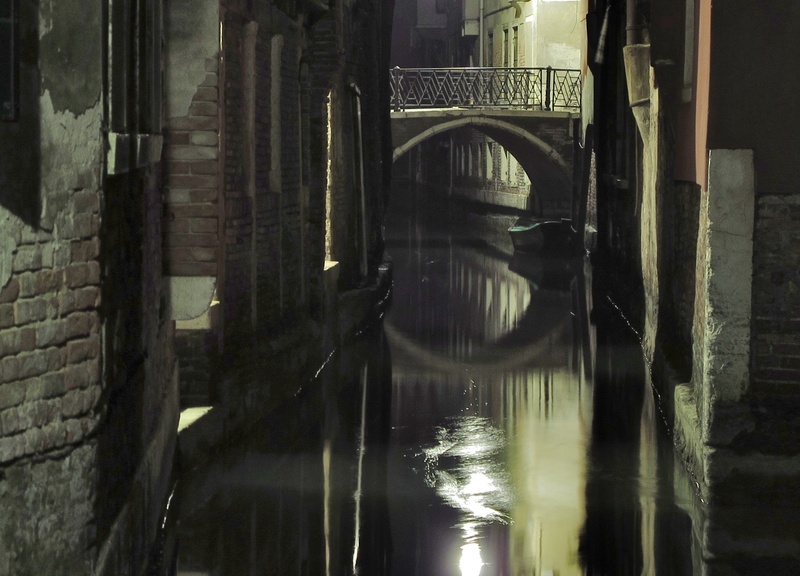 The images of Venice capture the heart and sad reality of an extraordinary and unique city. Venice is so well-known and so many of the views of it have been reproduced, but usually just emphasizing the grandeur of some of the glorious buildings, bridges and piazzas. The result is a city frozen in time, with its living identity kept secret and unseen by the casual visitor or tourist. Your very moving and original images remind me of the time I spent there. Far more movingly and personally than any perfect composition featuring a famous landmark, shot to death by guided tour groups. “Ponte Marcello” © 2011 by Charles Christopher; for permission to reuse, contact the artist at charleschristopherphoto [AT] gmail [DOT] com. “Don’t Look Now” trailer is embedded from YouTube.com. This entry was posted in film, photography and tagged Charles Christopher, Daphne du Maurier, Don't Look Now, Donald Sutherland, film, Italy, Julie Christie, Nicolas Roeg, photography, Venice. Bookmark the permalink.